Diving Bell, a hollow inverted vessel, in which persons may descend to considerable depths, fresh air being forced down from above to supply the amount required for breathing, and under which upon the bottom they may work to prepare foundations, or to secure articles of value. The principle of the diving bell is seen in pressing any vessel like a tumbler mouth downward into water. The air within the vessel prevents the water from rising and filling it, but it is made to occupy less space as the pressure is increased with the increasing depth of the water. If the v. were forced down to the depth of 33 ft., the water would half fill it. Such is the simplest form of the diving bell, as it was known probably in the time of Aristotle, mention being made that divers at that period took down with them a kind of kettle to enable them to remain longer under water. During the reign of Charles V. a satisfactory experiment was tried by two Greeks at Toledo, in Spain, in the presence of the monarch and his court, of descending in a large inverted kettle into the water with a burning light, and coming up dry. 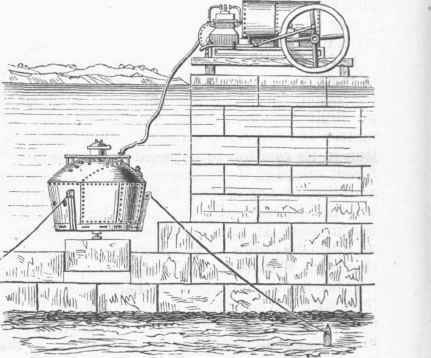 But in this experiment, made by order of Charles to prove the possibility of the thing, and in others also undertaken for practical purposes (as recovering sunken treasure) in the course of the succeeding 200 years, there was no provision for renewing the supply of air as it became exhausted, nor for keeping the vessel free from the water forced by the pressure to rise within it. About the year 1715 Dr. Halley contrived a method of furnishing air to the bell while it was at the bottom. He had two tight barrels prepared, each with an open bung below, and a hose attached to the top long enough to reach outside below the bottom, in which position the air could not escape through it. These, loaded with weights, were sunk alternately, like two buckets in a well, or, by guys attached to the bell, were made to drop alongside of it. A person within, reaching out into the water under the mouth of the bell, could draw in the hose and raise the end of it above the level of the top of the cask, when the air would be forced upward and furnish a new supply to the bell. All the water would thus be displaced, and one could step about upon the bottom over the area covered by the bell. The air contaminated by breathing was let off by a stopcock in the roof, and pieces of glass set in here admitted the light. In the apparatus thus prepared Dr. Halley descended with four others, and remained an hour and a half in water more than nine fathoms deep. He soon afterward devised an apparatus with which one could leave the bell and walk on the bottom for a considerable distance. The diver was furnished with a heavy metallic cap, which was connected with a long flexible tube for conveying air within the bell. Heavy weights were attached to his belt and also to the feet to counteract the buoyancy of the body at great depths. Numerous modifications in the construction of the bell continued to be made by others, none of which proved to be of much importance until the engineer Smea-ton applied the air pump about the year 1779 to forcing down the air, and made the first application of the apparatus to engineering purposes. In 1788 he constructed a bell of cast iron, in the form of a chest, 4 1/2 ft. long, 4 1/2 ft. high, 3 ft. wide, and weighing 2 1/2 tons, so as to sink by its own gravity. - The most practical form of diving bell is called the nautilus, which is a sort of submarine boat whose lateral as well as vertical movements are controlled by the occupants. It is constructed with double sides, sufficiently far apart to form either air or water chambers, as it may be required to ascend or descend. In descending, they are supplied with water enough to cause the machine to sink. In ascending, the water is forced out by an air pump, worked on shore according to signals. It may be given considerable buoyancy, depending upon its size, and heavy weights may be raised with it. A plate is adjusted to the bottom, which may be removed at pleasure, air being pumped in to balance the hydrostatic pressure. Cables, worked by windlasses inside, pass out through holes surrounded by water-tight stuffing boxes, and are made fast at convenient distances. These enable the occupants to move the nautilus in any desired lateral direction. A manhole at the top, conveniently closed by a cap, permits entrance or exit of the operators. The tube which connects with the air pump above water is used for forcing air either into the water chambers or into the central chamber. Pipes with stopcocks readily enable the change to be effected. - The increase of pressure experienced in descending in a bell affects individuals differently. Usually a pain is felt upon the tympanum of the ear, caused by the pressure upon the outside not being at once counterbalanced by the air within the tympanic cavity having acquired the same density. The construction of the Eustachian tube, leading from the mouth to the internal part of the ear, is such that a little time is necessary for the compressed air to make its way within. This usually takes place by a sudden impulse, which may be hastened by an effort of the individual like that of swallowing, the mouth and nostrils being closed at the time.